Brian Henry David Murphy is a custom woodworker. His focus is on custom-built furniture, largely in the Arts and Crafts style. When Brian builds a chair or other furniture, he selects the perfect board, not pieces like a large store manufacturer might use but the perfect board that will showcase the finished project. 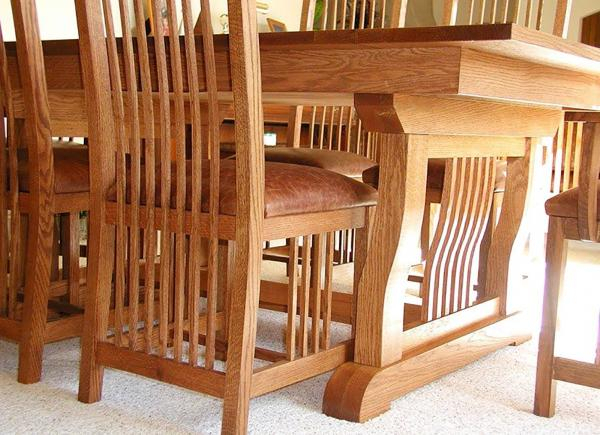 For example, the grain pattern found in the arms of a bow arm chair are usually quite striking and can make each chair unique, one of a kind and highly desirable. Like most successful businesses, Murphy’s Fine Furniture is not an overnight success story. Brian owned The Cutting Edge, a woodworking retail store from 1980 through 1989. He first started building custom furniture while running The Cutting Edge. The first piece was a butcher block mobile kitchen unit built with a hard rock maple top, birch sides and walnut sliding doors with dovetails. In his diary, Brian keeps a diary recording every piece he has ever made, this is piece number 001. Brian has been designing furniture since 1981 and has become recognized as a leader in the Arts and Crafts design discipline, having received numerous local, regional and national awards. For nearly thirty years Brian also sold furniture design woodworking plans nationwide, through his company, American Furniture Design. This included printing a 68-page catalog describing the plans and support products that was bulk mailed nationally. One day Brian remembers a call from a lady back east. She had his catalog, was calling in her order for all kinds of plans and wanted to know when the truck would arrive to deliver her furniture and did he know that she lived on the third floor and how would Brian’s delivery guys manage to get all the furniture up the stairs. A few years ago, Brian and his spouse Nancy sold the plan company to Lee Valley Tools in Canada who continue to market the plans worldwide. Let me introduce Brian’s partner, his Indian princess of 54 years, Nancy Darlene Bearskin Murphy. It was 1963. Brian reluctantly went on a blind date his sister had arranged. Turns out, it was love at first sight. He fell in love with Nancy and asked her to marry him. Brian was then in the Air Force and he arranged to meet Nancy’s father, a famous Air Force colonel, a man that was a captain in the Jolly Rodgers of South Pacific fame (a fighter squadron in the U.S. Navy in WWII and the subject of a book) in his office to ask for the colonel’s daughters hand in marriage. Brian remembers haltingly making his intentions known, only to be met with the colonel’s complete silence and a long, hard look. ”The bride price is five Indian ponies” the colonel said. Brian nearly collapsed wondering where he could possibly find five Indian ponies! Leaford Bearskin (Nancy’s father) later became Chief of the Wyandotte Nation in Oklahoma. Chief Bearskin was recognized as American Indian of the Year during the Reagan administration. Brian resides in Escondido with his wife Nancy. They have two children and three grandchildren. For a bit of an adventure visit our web page at the Gallery Section Click Here to see the really different collections that we make.